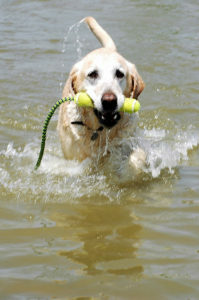 When it comes to dog toys it’s hard to compose an exact list of what’s the best; in this case, what the best dog toys for labs are. Each dog has their own preference when it comes to their toys. Some may like playing with something fruit-themed, some a bone, and others may enjoy an animal look alike. If your lab is a chewer, you may want to look into the best toys for chewers. I can’t specifically say what the best toy may be for your dog, but I’ll do my best to make you aware of what the most popular toys for labs are based off of top sellers and top favored (same with their beds). Now, as you look at the list below, do keep in mind your dog’s’ needs. If they are lonely I’d recommend getting the labrador clone, if they’d like to play with you, the owner, ponder on the floppy disk, and if they just want to play alone look into the bone or ball, and so on. Planet Dog Orbee – Similar to the Bone, this is also non-toxic. It’s a great dog ball coming in one of three sizes: small, medium, or large. This bouncy ball is also very tough on the chance that your lab is a chewer. To surprise your dog, this buoyant ball also glows at night (if you keep it in the light during the day)! If your dog is doing well with behavior, tricks, or what you may be encouraging, you can use the whole on the sides as a treat dispensary! There certainly are quite a few unexpected benefits to this ball than just it’s bounce. Kong Dog Bone Toy – Picking between the medium or large size, you can also order a pack of 2 either as a back-up or simply a second bone for your dog. KONG’s bones are made with non-toxic durable rubber. They also own a patent for “goodie grippers” which adds value to their rubber based bone toys. If you have to leave your dog at home as you go off to work or can’t play with them as much as they’d like even when you’re home, this will keep them busy and entertained. Smart Pet Love – If your dog is the only pet in your household, or doesn’t play with the others, this may be your best bet. If batteries are added, you can add a touch of a genuine heartbeat to make your dog think it’s a real dog (of course, if possible, getting another dog is always the best solution if you can manage). Coming in 5 different colors you have the option to pick your lab’s favorite color! Also, an additional bonus to the Smart Pet Love is that it’s a heat pack which can keep your dog warm and comfortable as it plays with its new partner. PetSafe Busy Buddy – Keep your lab, or any other dog, busy with this toy. This plaything is specifically meant for dogs under the age of 6 months (though older dogs can still be attached to this toy) and for pets weighed around 20 to 50 pounds. Such as the ball mentioned above, it also works as a treat dispensary. It’s dishwasher safe and gentle on your dog’s teeth as well. Floppy Disc – Make it melon-themed or buy it with a classic look. It’s not recommended to use this as a chew toy, simply just a fetch toy. It’s soft on your pets teeth and the disc is made with hard plastic to stay durable. Depending on the size of your dog, you can either get a 7,10, or 12 inch sized floppy disc.